Memeni is a robust, business-friendly online community engagement solution that can be easily integrated with your current websites and social media platforms. The software allows you to create and deliver a personalized experience of your brand to each member of your audience – without the need to shell out large sums of money to pay to reach them. With Memeni, you are able to create a social community that provides you with deeper insights into your customers, their tendencies, thoughts, behavior, and other aspects that help you better understand them. Knowing your customers better makes it easy for you to create engaging solutions and strategies that will then drive revenue and business growth. For the purpose, Mememi offers a variety of engagement tools (videos, coupons, challenges, and events), as well as a proprietary algorithm that ensures members of your community will get just the right content they’re looking for. Memeni allows you to create an avenue where your customers can converge and converse with fellow customers and your business. This solution gives them a platform to voice out opinions, submit ideas and suggestions, discuss possibilities, and provide help and assistance to others. With Memeni, companies and organizations can create a trove of unadulterated insights from people who actually use their products and services, derive lessons from each interaction, and apply them to further better what they currently offer. 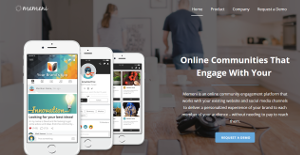 Memeni lets your community members share and discuss their ideas and more with powerful engagement tools. Content features like challenges, coupons, videos, and events do not only make your community engaging, but also provide rich experiences for each member, encouraging them to come back for more and empower other people to do the same. The best part is that your brand is at the center of everything. Experience is personalized for each client, and traffic is driven directly to your app/website instead of third-party services. It is exactly because of this that Memeni is perceived to be a flexible solution, able to support the growth and development of your business. As simple as it sounds, the community’s members become your brand ambassadors. What is also interesting to know is that Memeni utilizes its own proprietary algorithm to analyze community members, and to determine the perfect content for targeted marketing purposes. This result is providing personalized experiences for your audience, and better response rates. Your team will also like Memeni because of the friendly and easy-to navigate interface, unrestricted access to data from all devices and operating systems, and 24/7 live/phone support that is there to answer all of their inquiries. What Problems Will Memeni Solve? Memeni is for any business, non-profit, or individual with a sizable online audience who is looking for a way to foster deeper, more meaningful relationships with their audience. It is important to keep in mind that hardly any service in the Collaboration Software category will be an ideal solution that can match all the requirements of various company types, sizes and industries. It may be a good idea to read a few Memeni reviews first as specific solutions might perform well exclusively in a very small set of applications or be created with a very specific industry in mind. Others might work with a goal of being simple and intuitive and as a result lack advanced functionalities needed by more experienced users. There are also solutions that cater to a large group of customers and offer a powerful feature toolbox, but that in most cases comes at a higher price of such a service. Be certain that you're aware of your requirements so that you select a software that offers all the functionalities you look for. How Much Does Memeni Cost? We realize that when you make a decision to buy Online Community Software it’s important not only to see how experts evaluate it in their reviews, but also to find out if the real people and companies that buy it are actually satisfied with the product. That’s why we’ve created our behavior-based Customer Satisfaction Algorithm™ that gathers customer reviews, comments and Memeni reviews across a wide range of social media sites. The data is then presented in an easy to digest form showing how many people had positive and negative experience with Memeni. With that information at hand you should be equipped to make an informed buying decision that you won’t regret. What are Memeni pricing details? What integrations are available for Memeni?